Children (and even grown-up children!) love leisure parks with tree top adventure trails. That's lucky, because the Loire Valley has plenty of opportunities for going on forest adventures. 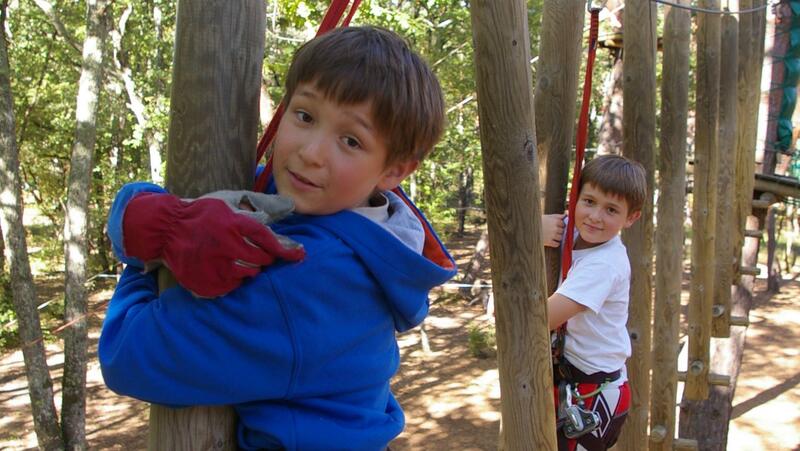 There are endless dizzying monkey bars, zipwires, and Tarzan swings to enjoy! If you're near Orléans, head to the leisure park Léo Parc Aventure for a tree top adventure featuring 140 obstacles and 12 different trails. There is something for everyone: the youngest can follow the "kids" trails and the others can take the red or even black trails for the most daring. There are zipwires everywhere, offering 1,100 metres of thrilling experiences which are rivalled only by those along the night trail, which is certainly out of the ordinary! You will find more tree top trails near Chinon, at Saint-Benoît Aventures park. 140 obstacles await you here offering a mixture of zipwires (38! ), monkey bars and Tarzan swings. All up to 20 metres above ground! You will find the same thing in Saumar, at Parc Saumur Forest Aventure, where traditional zipwires, ropes and bridges feature among the 75 obstacles hung in the trees. You can even play laser games there! Not far from Paimboeuf, in Frossay, the Parc Défi Nature – Escal’arbres offers you the opportunity to climb to the tops of 100-year-old trees. Well harnassed up, families can try out its 6 tree top trails and 90 or so obstacles spread out over 5 hectares of forest. Worth testing out are: the giant zipwires, the 32m-long net tunnel and the lead into the void, 15m from the ground! At Pornic Aventure, the zipwires are even more dizzying because they're above water: as you fly through the air, you will cross the lake of Val Saint Martin!